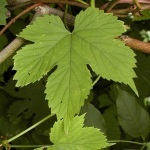 Hop is a climbing perennial wine and a member of the small hemp family. It is one of the fastest growing temperate plants. In July, when the growth is at its highest, the stalks may lengthen more than 17 cm a day. The stalks are using stiff hairs for twining counter-clockwise around anything within reach (as seen from the plant). Hops are the female flowers. They are carrying multitudes of small yellow 'lupulin' glands (barely visible in the photo on the right) with a bitter resin. Hops were adopted by the monastic breweries as an important flavouring and stability agent in beer. Bohemia and Bavaria became the first places where hops were grown in large plantations. Today a number of varieties are grown from China to USA. Hops contain several characteristics very favourable to beer. 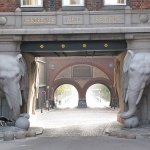 They contribute a bitterness that balances the sweetness of the malt. Hops also contribute aromas which range from flowery to citrusy or herbal, and hops have a mild bacteriostatic effect against Gram-positive bacteria and favours the exclusive activity of brewing yeast in the fermentation of beer. The flavour and bitterness imparted by hops depends on variety and kind of use. Most of the common commercial lagers have fairly low hop influence, while true pilsners should have a noticeable noble hop aroma. Certain ales (particularly the highly-hopped style known as India Pale Ale) can have high levels of bitterness. The 'Deutsche Reinheitsgebot' (German purity law for beer) states that only water, malt, hop, and yeast are allowed as ingredients for making beer. 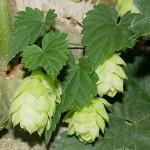 The bitterness of hops is due to isomerisation products of so-called alpha and beta hop acids. During worth boiling, these reactions are promoted. An example is shown for the alpha-acid humulone  . The hop aroma derives from a complex essential oil, present in low concentration. Beta-myrcene and the sesquiterpene humulene are the major volatiles . On the basis of flavour dilution factors, trans-4,5-epoxy-2(E)-decenal, linalool and myrcene were identified as the most potent odorants in the hop variety Spalter Select. In fresh hops, 3(Z)-hexenal was characterized as a further key odorant with a green aroma note . 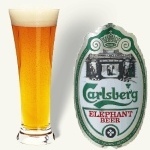 The hops are known for their slight narcotic effect and sedative properties. The bitter decoction ('tea') of fresh or dried hops may be used as a sleeping medicine. See also hemp. Etymology: Lat. Humulus, from German Hummel; Lat. lupulus, diminutive of lupus, wolf, i.e. 'small wolf', because of hop's vigorous overgrowing of other plants. 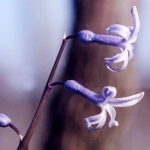 Wild hyacinth is a small, slender plant with only a few, blue flowers on its shaft (picture on the left). On the other hand, it is very fragrant. The polyploid varieties of the florists are showy, but often their scent leaves much to be desired. A few odorants from hyacinth are shown  . 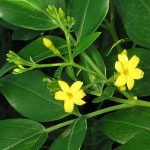 The tertiary ocimenol is also found in madagascar jasmine. Cinnamic alcohol has a fine, balsamic odour. Ethyl 2-methoxybenzoate has a sweet, floral, heavy-fruity odour. Etymology: Lat. 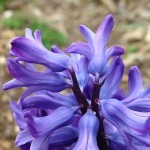 orientalis, hyacinth originates in the eastern Mediterranean area. 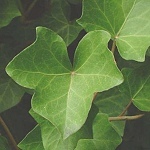 Common Ivy, a climbing bush with leathery perennial leaves able to lift itself to 30 m, is known by everyone in Europe. In the autumn (September-October), the upper branches of mature plants (8-10 years old) yield plenty of honey-scented flowers rich in nectar. 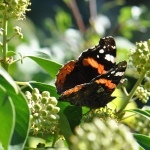 These are very popular with insects, especially since other flowers are becoming sparse at this time of the year (the photo shows a red admiral butterfly (Vanessa atalanta) feeding on ivy flowers at The Citadel of Copenhagen in late September). Marica Maretic analyzed the nectar from ivy flowers and found that the major volatiles were oxo-isophorone, isophorone, oxo-damascone, damascenone, phenylacetaldehyde, phenylacetonitrile, 3-hydroxy-4-phenyl-butan-2-one and nonanal . 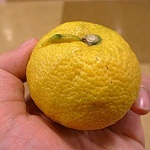 The Japanese sour citrus fruit called Jabara was only recently registered as a new species. Jabara (see also Yuzu) has been used locally for culinary and medicinal purposes for a long time. It is claimed to possess anti-allergenic properties. 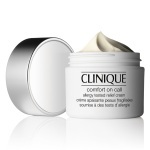 An extract from Jabara is used in Clinique's new "Comfort on Call" skin conditioner. The volatile compounds of Jabara peel oil have been investigated using GC-MS and GC-olfactometry. Interestingly, myrcene (47 %) was the major ingredient whereas limonene, usually the most abundant ingredient in citrus peel oils, was only second (28 %) together with gamma-terpinene (15 %). Odor-determining constituents in addition to myrcene, which has a fresh herbaceous resinous-woody odor, were shown to be undecatrienes and undecateraenes with fruity and green odors and the novel natural constituent 7-methyl-1,6-octadien-3-one having a metallic and mushroom-like odor . (-)-jasmine lactone, (Z)-jasmone, (-)- and (-)-epi-methyl jasmonate. Shown above are benzyl acetate, p-cresol and indole. Spanish jasmine originates in the valleys of the lower Himalayas. It was brought to Spain by the Moors and was spread through the Mediterranean area during the 17'th century. 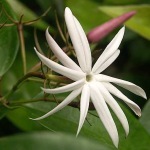 By extraction of the flowers, the so-called jasmine absolute is obtained, one of perfumery's most precious materials. Jasmine absolute is a brownish paste with an intensely floral, warm, rich and highly diffusive odor. Minimal amounts create wonders in perfumes of exotic-floral character. It takes about 8000 freshly picked flowers to make 1 g of absolute. Egypt is the main producer, but demand is lowering. In recent years reconstructed oils have been available, almost identical with the natural product, but at a much lower prize. 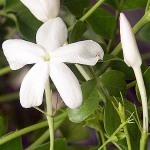 The fragrance of jasmine is characterized by 'jasmonoid' compounds, whose biosynthesis from unsaturated fatty acids probably follows the same routes as the biosynthesis of prostaglandins in us. They are also found in other flowers, e.g. gardenia. The main component of jasmine absolute is benzyl acetate (ca. 34 %), having a fruity-floral odour. p-Cresol and indole contribute to the animal aspects of the jasmine fragrance . 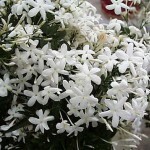 About 200 species of jasmines are known from tropical and subtropical areas around the world. 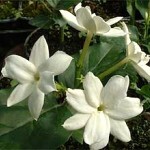 Most of them are heavily scented, their fragrance varying around the common jasmine theme. Arabian jasmine, J. sambac, also called 'Maid of Orleans', Pikake (on Hawaii) or Tea jasmine, is characterized by a diffusive, green-herbaceous nuance from derivatives of 3-hexen-1-ol . The photos below show from left to right Arabian jasmine, J. sambac, Chinese jasmine, J. polyanthum, Canary jasmine, J. odoratissimum, and Shining jasmine, J. nitidum.